Chris was excellent. I have no doubt why he has a Diamond Certified business. He's very knowledgeable, professional, and I definitely would recommend them in a second. My neighbor recommended him to me because Chris did their whole stairs. While he was there, he opened up my side of the stairs to take a look at the problems with them. He was very knowledgeable and he told me what could happen, but we were not ready to do that big of a project. He went above and beyond, and kindly accepted a job fixing our stairs temporarily, since he was doing the ones next door as well. He really helped me and it was a lifesaver that I didn't have to find someone else to do it. I didn't even feel like I had to go check on the work. I could already tell from the work next door that he deserves to be Diamond Certified. 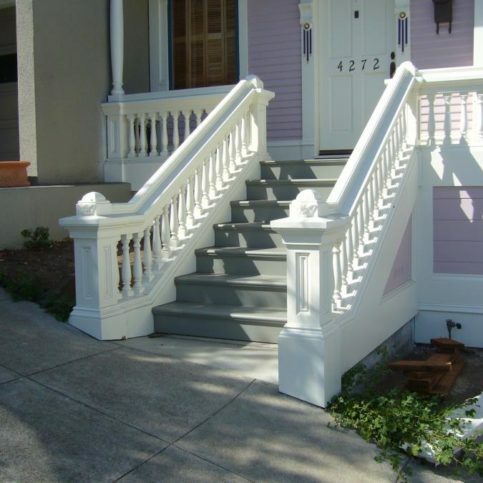 My neighbors' stairs are finished and they look absolutely beautiful, we really like the job he did. I think the work is fantastic and I love the folks he employs. I trust them 1000% in my house and I've left them working on projects when I wasn't there. He does a really good job, based on what I've heard his prices are fair, and the people he employs are very trustworthy. They do a very good job, although it's very expensive. They were here on the job and did craftsmanship work. 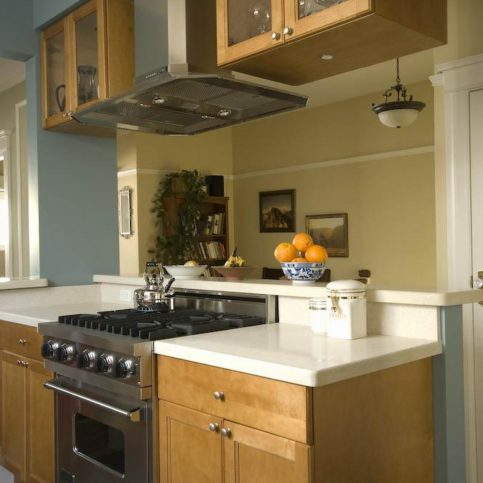 Christopher Wells Construction, Inc. provides a variety of residential remodeling services for clients throughout San Francisco and San Mateo County. 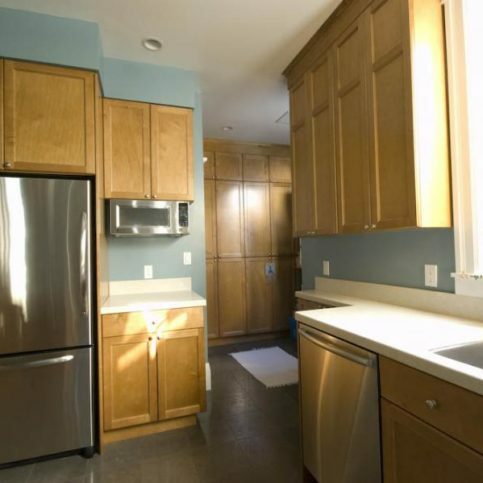 The company focuses on building room additions and remodeling kitchens, bathrooms, decks, foundations, and more. Owner Christopher Wells has been involved in the construction industry since he was 14 years old. He began his career as a carpenter and spent many years as a home inspector, where he evaluated more than 3,000 structures and gained a thorough knowledge of Bay Area residential construction issues. Mr. Wells founded Christopher Wells Construction in 1984 after earning his general contractor’s license. 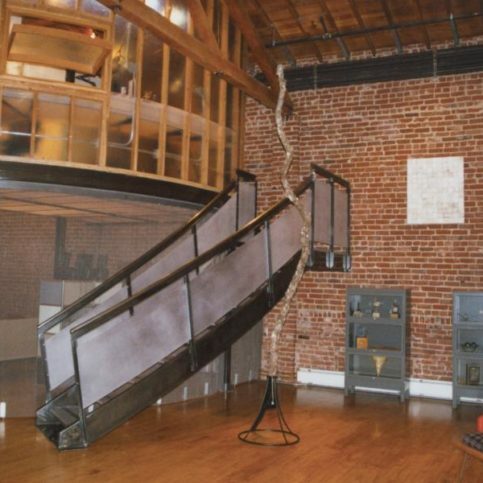 Christopher Wells Construction stresses communication through all phases of its projects. If clients have any questions or concerns, the company’s foreman is either onsite to immediately address them or is available by phone. DIAMOND CERTIFIED RESEARCHED CAPABILITIES ON Christopher Wells Construction, Inc.
Company Name: Christopher Wells Construction, Inc.
DIAMOND CERTIFIED RESEARCHED ARTICLES ON Christopher Wells Construction, Inc.
Christopher Wells Construction, Inc. has been remodeling and repairing San Francisco and San Mateo County homes since 1984. 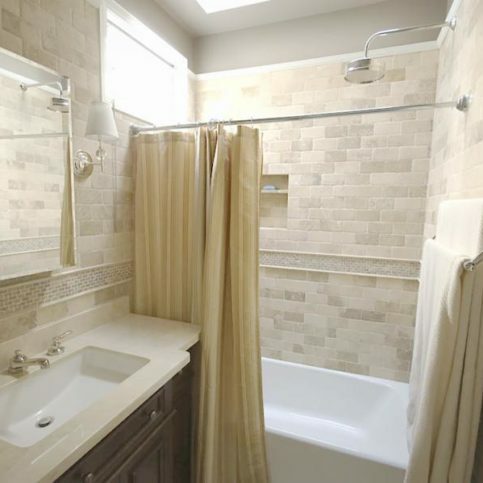 The company builds additions and works on bathrooms, kitchens, decks, foundations and more. Owner and company namesake Christopher Wells started his construction career as a carpenter and has been gaining hands-on industry experience ever since. Christopher Wells Construction’s crew members are all experienced journeymen with a minimum of three years with the firm. “We take pride in the amount of experience we provide,” says Mr. Wells. “In fact, our foreman has been with us since 1987.” The company uses the same crew for every job, so its members have learned to function effectively as a team. It also prides itself on its communication skills–if homeowners have any questions of concerns, the foreman is either onsite to immediately address them or is available by phone. • Find the source of the mold. Check for things like leaking pipes or water seeping in through walls or the floor. Immediately remove any water and use dehumidifiers or fans to help dry the area. • Wet the affected area with a sponge or rag. Wipe off as much mold as possible. • Use a spatula to scrape off any visible, remaining mold. Use a non-metallic spatula if you’re worried about scratching a surface, such as a finished wood wall. • Mix a solution of water, chlorine beach and laundry detergent. For concrete mold, mix 1 cup of bleach and 1/2 cup of detergent for each gallon of water. For wooden walls, use 1/2 cup of bleach. Test the solution on a small part of the wall. If the wood changes color, use a solution of water and detergent only. A wood-cleaning product can also be used on a wooden wall. • Thoroughly scrub any area or item that has mold. Use a sponge or rag for wooden walls and a sponge, rag or bristled brush for concrete. Scrub as hard as possible to help remove mold from its roots. 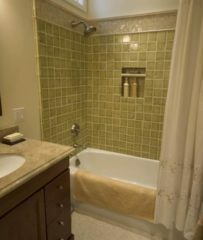 • Rinse the area thoroughly and dry it with a fan or humidifier. 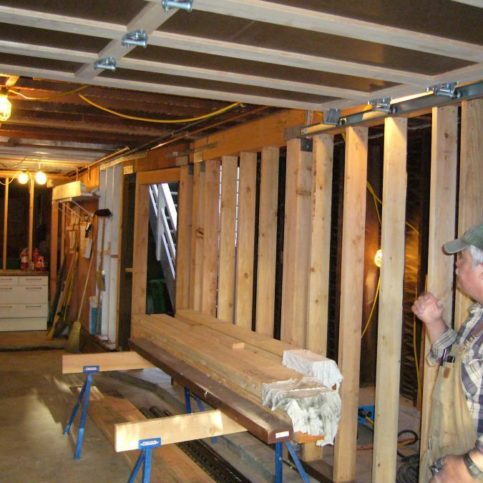 • Treat the basement with a commercial mold-killing product. • Place the mold in garbage bags and take them outside immediately. Q: Do you provide written project schedules? A: Yes, depending on the project. Some projects are straightforward and don’t require a lot of paper plans; more complex projects do. Regardless, we’ll be in constant contact so you know the status of your project and its work schedule. A: Yes. We pay extra attention to cleanliness. We put up temporary protection to contain dust in the work area and bring a portable toilet to the site so we don’t disturb you by using your bathrooms. A: We use some subcontractors for specialized, non-carpentry work. But we use the same subcontractors all the time, and we have good working relationships with them. In effect, we’re one crew. A: Yes. We carry both liability and workers’ compensation insurance. 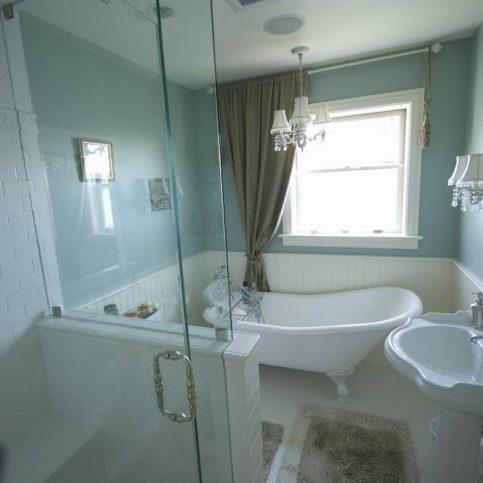 SELECTED PHOTOS FROM Christopher Wells Construction, Inc.
Christopher Wells Construction worked on this bathroom in a 1920s Tudor home and added a claw-leg curved tub. 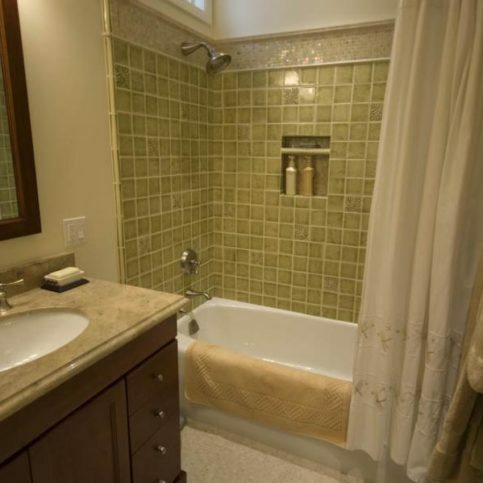 Christopher Wells Construction used unusual tile and a square sink to give this bathroom a modern look. 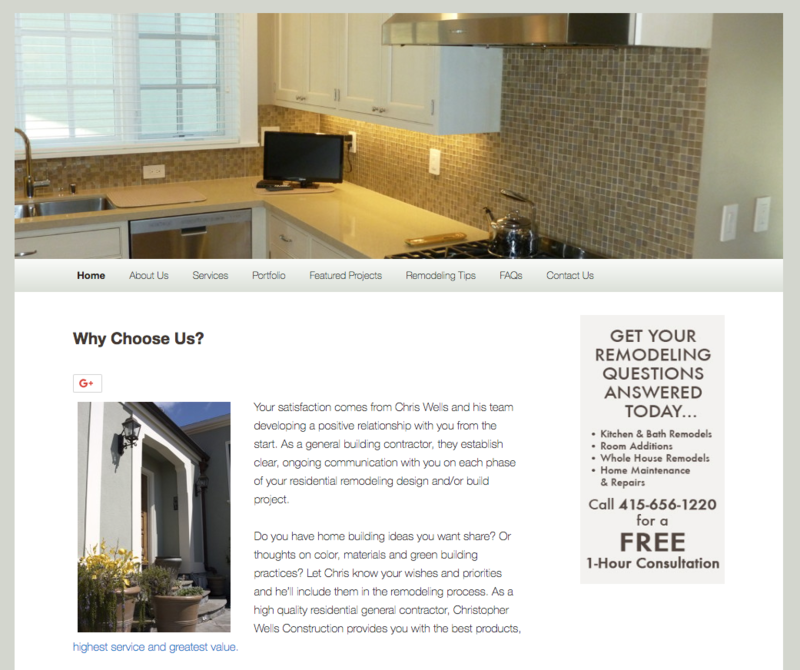 Owner Chris Wells only uses top-quality building materials. Christopher Wells is a 32-year veteran of the construction industry and owner of Christopher Wells Construction, Inc., a Diamond Certified company since 2003. He can be reached at (415) 347-6907 or by email. Outside of work, Christopher dedicates most of his time to his other passion: singing opera. “I sing with the Verismo Opera and the Bay Shore Lyric Opera,” he says. “Because of my age and baritone voice, I usually play fathers and older, wiser figures, but my favorite role to play is that of the villain. One of my favorite roles is Iago in Giuseppe Verdi’s opera version of ‘Othello.’” In addition to singing, Christopher enjoys traveling with his wife, both to international destinations like Europe and different parts of California to visit friends. Q: What’s your favorite opera? A: “Rigoletto” by Giuseppe Verdi. A: La Ciccia in San Francisco. A: Being a musician. I played the double bass, the bass violin and the trombone. BRISBANE — Host, Sarah Rutan: To ensure earthquake safety, you’ll want to know the condition of your home’s foundation and whether it needs to be repaired or reinforced. Today we’re in Brisbane with Diamond Certified Expert Contributor Christopher Wells of Christopher Wells Construction to learn more. Diamond Certified Expert Contributor, Christopher Wells: Hi. 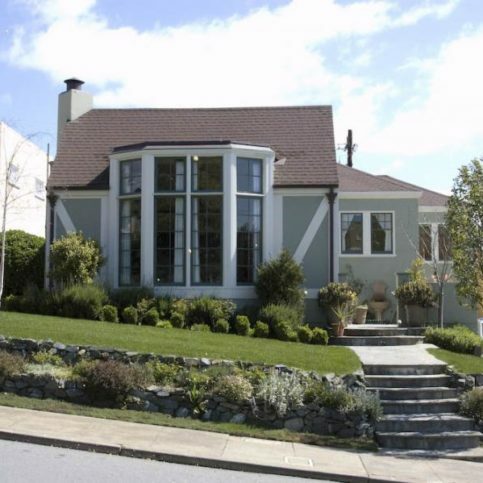 My tip is regarding concrete foundations in the San Francisco and North San Mateo County area. Most of the houses that I work on are in those areas, and they mostly have what we call perimeter foundations as opposed to a slab foundation. Houses that were built in the early part of this – of the previous century – like the 1920’s and thirties – may have foundations where the builder used local materials, which was not a good thing. If they use local sand, it would have impurities in it, and that leads towards degradation of the concrete. They also probably didn’t use enough portland cement, which was very expensive in those days. You can identify that if you go down into your basement, and take a hammer or a screw driver to your foundation, and try to scrape off pieces of your foundation. If you’re successful, that means you should probably call an engineer and have him look at the foundation, because you may need repair. Another problem that we often see is differential settlement of the foundations. Because, in the old days, they didn’t build foundations with as large a footing as we use nowadays. So, the foundation components will sort of knife down through the ground. What you can do to look for that is keep an eye on the interior of your house for diagonal cracks in walls above doors and windows. And, if you find that a door or a window that has been functioning okay in the past suddenly gets jammed, shut, or won’t open, then you may have a settlement problem. And, you should also call an engineer for that. Diamond Certified RATINGS ON Christopher Wells Construction, Inc.
Christopher Wells Construction, Inc. : Average 9.3 out of 10 based on 140 unique customer surveys of customer satisfaction. Very accommodating and patient with not only our inexperience, but also patient with an unfortunate situation with our neighbor. He dealt with it with aplomb. Very good at what he does and a pleasant person to work with and he is very dependable and he did exactly what he said he was going to do. I have had some experience with other contractors, both hiring them and also having them come around and give me estimates and I can say that Christopher Wells Construction is definitely in the top tier with the quality of work and his honesty and the people he employs have excellent skills. The quality of the work and the people he employs, their skills are excellent. And not only the skills, they can communicate what needs to be done and why. They are very courteous. 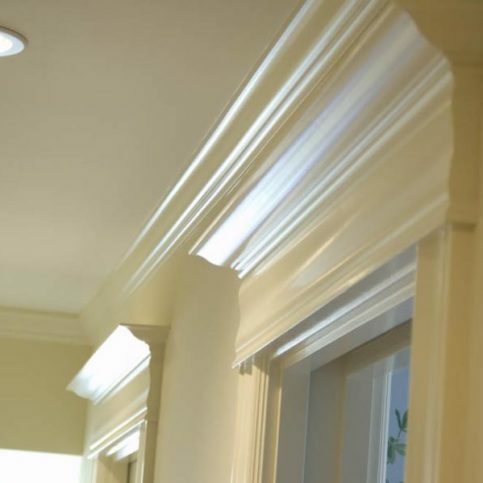 It went very smoothly and they are very good on scheduling and when things come up, which they do in older houses, it wasn't a forever wait to get people to come in to do what needed to be done. He was very accurate and punctual. He was there when he said he would be there. I think he is smart and thorough. He is not cheap, that is where my struggle lands. In the end, because he has thought it through, you get an accurate price of job. His attention to detail is what I like. They're highly competent and friendly. They are easy to work with, responsible, and timely. They have good, quick communication. They were very accommodating in terms of responding to needs, and the quality of the work was very high. They're highly professional, excellent to work with, and very skilled. I had a very positive experience with them. The quality of their work, and the professionalism with which they ran, and communicated on the project. It was a really good experience. I think that he's very honest, very trustworthy, and the team he brought with him was very competent. We've dealt with other contractors in the past and I'd definitely say he's the best. I would recommend him. His professionalism, he did provide everything on a timely basis, and I had no expectations he didn't satisfy. He did a very good job. My exposure to them was limited, but people the people that Chris sent my way and worked on my project were fantastic. Chris is very communicative, his staff is efficient, and they are friendly. They always went above and beyond. I would give them an '11'. He had a lot of very good input, and he brought a good perspective. He was very thorough, and he stayed within budget, which was always good. They do excellent quality work, and they aim to please the customer. They use good quality materials. They are easy to work with, and they are on time, usually early. Probably the quality of work, I am a very picky person, and they did well, even with me being very picky. They were excellent and the cream of the crop. They are prompt about responding to calls if you have questions. If you have a problem, they come out as soon as they can. He was professional and he held as close to the timeline as physically possible. He did excellent work and he had an excellent demeanor. C. S. S. F. L.
He controlled the project really well and everything was on budget. He does quality work and he doesn't argue with you. Everything he said was reasonable and his cost was reasonable. The best was that he was easy to work with. Also, he does quality work and his people are professional. He does a great job. He's professional and he speaks the truth. He does a good job. I would say the quality of the work, also, the straightforwardness and honesty of the procedure.